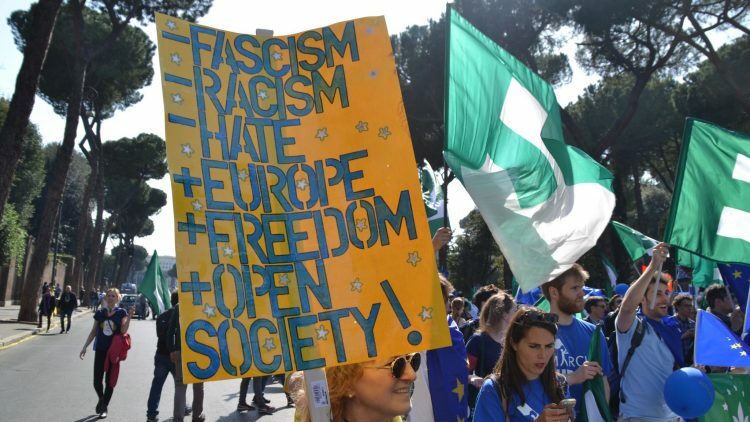 There were tens of thousands, a real human river, people from different parts of the world that today, March 25th, participated in two demonstrations: “Another Europe” and the European Federalist Movement. They started from different places, Piazza Vittorio Emanuele and Bocca della Verità, and after having peacefully and joyfully crossed the streets of the capital, they met early in the afternoon at the Arc de Costantino. People of different nationalities and of all ages, many young people who with strength did not cease to shout their passion for the will to build and desire for a new Europe, that of the citizens for the citizens in which the fact of federating with others can open opportunities to have a continent with solidarity that also guarantees real integration between peoples. These were the voices heard on the Roman streets and these are the aspirations for a Europe of citizens, and not one of provincial bureaucrats, with which it is intended to leave 60 years of immobility and hypocrisy. We were also present and took advantage of immortalizing some of the moments of the demonstration which, despite the concerns and fears of the previous night, unfolded without incident, between smiles and songs, blessed by a splendid spring sun.